What can Canada Learn from Finland about Happiness, Health, and Education? Compared to other countries, Finland ranks high in terms of happiness, health, and education. Finland ranked number 1 this year for happiest country in the world, according to the UN annual report. The life expectancy of women is 84 years, and 79 years for men, which is similar to other OECD countries including Canada. Finland spends less, however, on healthcare, with total expenditure on health per capita being $3,701 in Finland, and $4,641 in Canada. In 2001, Finland ranked highest in the world on the Programme for International Student Assessment (PISA), an international education assessment, and today this Nordic country is still regarded as an global leader in education. Finland has its share of issues, but they are certainly doing some things right. I visited Kuopio, the 9th largest city in Finland population approximately 118,00. I noticed positive aspects about the people and environment that contributes to their health and happiness. 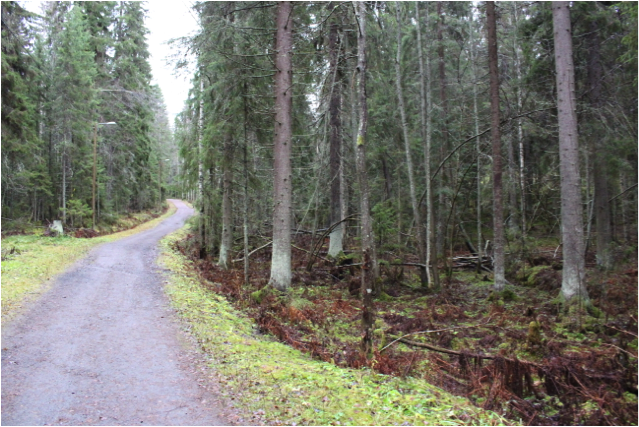 Finns love nature, and Kuopio has many trees and green spaces. There are forests surrounding the city, and there’s an abundance of walking trails through the woods. These trails are busy, too, rain or shine. I was in Finland in November, one of the darkest months of the year (I actually didn’t see the sun at all, and it got dark, or should I say darker, around 3 pm. And it rained… everyday). Yet, people were still out in the forest in the dark and rain. There are lamps on the trails. “We are nature people”, one woman told me. People don't give each other friendly waves or “hellos” when passing each other on trails like they do in Canada. I asked my friend why people don’t greet each other (they didn't seem very friendly or happy to me). She said it's because people want to be in their own thoughts while walking the forest, and there are so many people it would be somewhat impractical to say hi to everyone. I also think that Finnish people are less concerned with appearing happy than Canadians. They're less concerned with looking a certain way; they just are. In my observation, Finnish people are also more mellow and humble in general. When I was telling a Finnish person about what I thought Finland was doing very well (the features I am writing about in this article), she agreed but told me not to exaggerate things. She also thought it was interesting how when Canadians or Americans had a good experience, they often say things like “it was amazing”, whereas a Finn would say “it was pretty good”. The same goes with negative experiences. Finns are less dramatic and concerned with appearance, which likely also contributes to their health and happiness. The purpose of my trip was to complete interviews for my research on Health in All Policies. I interviewed government employees from various sectors, few of whom were from the healthcare sector. Nevertheless, all of them seemed to think health was part of their job. Every person I spoke to seemed to clearly understand that health is primarily determined by the environments in which we live. They recognize the importance of the built environment in influencing our decisions. To illustrate this, one informant told me a story about his children: one of whom tattletaled on the other, telling her father that her brother had eaten candy after school that day. When the father questioned the boy why he ate the candy, he said it was because the candy store is right beside the bus stop. This same informant, who is involved in city design and planning, told me that it is unwise to have restaurants like McDonald's beside high schools because high school students have money and are likely to be tempted to buy McDonald's food for lunch instead of eating the free, healthy school lunches. (I asked him about this because a high school in Caledon, ON, Mayfield High School, has a MacDonald's directly across the street). But doesn't this infringe on individual freedom and business opportunities, I thought. Although Finland is a democratic, capitalist country, like Canada, their mindset seems different. Well-being and happiness are important to Finns. Well-being is a focus in their city strategy, and the city conducts a yearly well-being report. I was told repeatedly by informants that when planning city services, residents are consulted and government employees have shifted from a mindset where they think about what services are offered to what the people need. In schools, children are taught to pursue work that is meaningful and fulfilling. Currently, some government departments are working on projects that aim to lessen loneliness in youth (especially young boys) through the arts. The people in Finland view engagement in arts and cultural activities as a means of improving health. Many informants also told me about community centres, where people can meet and socialize and engage in various activities. Finns are generally more quiet and shy than North Americans; yet, they recognize the important of being together and being social. If you go into a Finnish café or fly on a plane with mostly Finns, you’ll immediately notice a lower decibel environment; however, this quiet environment quickly disappears when Finns have been drinking, which is something they love to do but is negatively affecting their health. In Kuopio I had the opportunity to visit an elementary school. 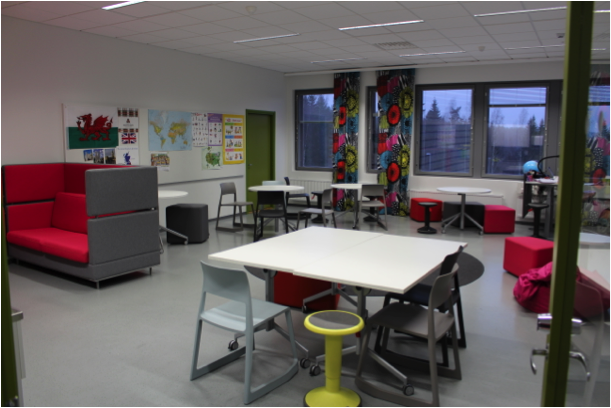 When I walked through the school, I noticed a cozier environment: kids weren't wearing shoes, only socks, and the classrooms had comfy seating areas and bright Finnish design curtains. I also noticed that classrooms appeared plainer, children’s work were not hung up all over walls. The classroom had a simple but welcoming appearance. I commented on the homey and cozy atmosphere, to which the people I was with responded by saying that was intentional. Timothy Walker, an American teacher who worked in Finland and wrote the book Teach like Finland: 33 simple strategies for joyful classrooms, says that the calmness of students and teachers in Finnish schools is partly the result of simplified learning spaces. During this school visit I also got to see the children outside during recess. I was surprised to see how active the majority of kids appeared, playing games and running around. I did not see one child on his or her phone. I had read about Finland's Schools on the Move initiative and wondered if what I saw was partly the result of that. There are other features about Finnish schools that I think help their children achieve high academic success and develop autonomy and wellbeing. Finnish elementary students have frequent breaks. After every 45 minutes of class, students get a 15 minute break. Another notable observation is that Finnish children commute to and from school independently. It is not uncommon for children as young as 7 to take a bus or walk to school…by themselves. In North America there have been incidents of police and children services investigating parents for neglect because they let their children walk alone. Such independence in children in Finland likely contributes to a sense of mastery and autonomy. 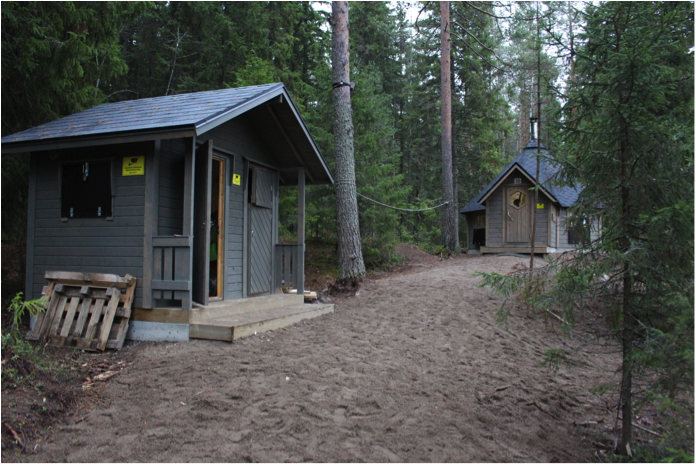 An increasing popular trend in Finland is sending children to forest kindergarten. I visited a forest kindergarten in Kuopio, where 15 six-year-old children were attending school. It was, as it sounds, in the forest. The children had no toys or electronics. Only the forest and some wood pieces and a soccer ball. There was a small building (a large shed, really) that was divided into an outhouse and a storage for wood. There was another small wooden building where the children would go in to have educational lessons and take naps. There was a wood fire in the centre of the small building, to provide heat and light. Neither building had electricity or running water. There was a standard kindergarten within a couple hundred feet, so that teachers and students could access running water and lessons could be taught there if needed, like when the temperature was very cold. The forest school teacher told me that children play outside in up to minus 20 degrees. I've heard it said in Finland that there is no such thing as bad weather, only bad clothing. The government employees I was with, who took me on the tour, told me that children who attend forest kindergarten are sick less often and have a calmer demeanour compared to children in regular kindergarten. There is a waiting list to attend. The women I was with also told me that they are looking into opening more forest kindergartens and possibly forest schools. She did, however, comment that she wished they had more research on the positive effects of the forest schools. I thought this comment was amusing since my doctoral supervisor had once said that Europe often has fewer government reports on health inequities but engages in many equity-promoting initiatives, and North America has a plethora of reports of health disparities but mostly lacks in their equity-promoting initiatives. Canada has a population about 7 times Finland’s, and Kuopio is very different from large Canadian cities like Toronto in many aspects, notably size, land availability, and cultural homogeneity. Nevertheless, I think there are positive features of Kuopio we can learn from and implement in Toronto and the GTA. “But Kuopio is so different”, you may say. I respond by asking why can’t we be creative and think about ways to implement some of their principles in larger cities like Toronto and its surrounding suburbs? Could we also ensure there are large green spaces in new developments where people can unwind, de-stress, and connect with nature? Research has indicated that being in nature has many positive impacts on health and well-being. Could we plant more trees and gardens? Could we think about what our citizens need and what promotes health instead of primarily thinking about what increases economic development? Could we have schools where children play outside most of the day? How can government officials and decision-makers change their thinking so that health is part of everyone’s role? While Toronto and the surrounding areas are a great place to live, they are not known globally for overall population well-being or happiness. Toronto actually ranked one of the unhappiest cities in Canada (this starkly contrasts with Kuopio, which was ranked 1st for happiest city in Finland in 2017). Toronto has some of the best schools, but the inequality of education is great, and the average primary and secondary school scores are not leading in world rankings. It is in the best interest of Canadians that we look to other countries and cities that have achieved success in health, happiness, and education and ask ourselves what we can learn from them and how we can create better societies that promote health and well-being. Maybe one day others will look to us. Maria is a doctoral candidate at the University of Toronto where she studies effective health policy solutions internationally, specifically a policy approach known as Health in All Policies. She is also affiliated with the Centre for Urban Health Solutions at St. Michael’s Hospital. Her research has been presented at an international health conference and in a global health policy journal.